← E is for Eggs: Fertilized eggs, quail eggs and sunny-side-up eggs. A long time ago, a northern village held a feast-tasting challenge to open the spring celebrations. The banquet table groaned under a spread of the rarest foods of the mountains and seas. Whoever could correctly name the tastiest dish would win. According to tradition, the competitors entered one by one. A single drum beat would signify that a person had chosen the wrong dish. Three beats in a row would signify a winner. Some contestants immediately chose the dish of shark’s fin and abalone, and immediately heard the single beat of the drum. Others sampled the very strangest and most precious dish, and yet heard the drum beat before even swallowing the first bite. At sunset, a stooped and silver-haired man arrived. He’d left his distant village at dawn and travelled all day. Leaning on his cane, he inched around the entire banquet table, eyeing each dish. Finally, he stopped. Serenely, he dipped his chopsticks into a tiny dish of fish sauce in the middle of the table, allowed a single drop to fall from the chopsticks onto the center of his tongue, closed his eyes and smacked his lips awhile, then nodded: “This is the only dish worthy of the title ‘most delicious’. All the foods on this banquet table—without this, they are nothing.” The drum beats rolled continuously, announcing that he had won. I wasn’t going to write about fish sauce, because I didn’t think I had anything new to say about it. 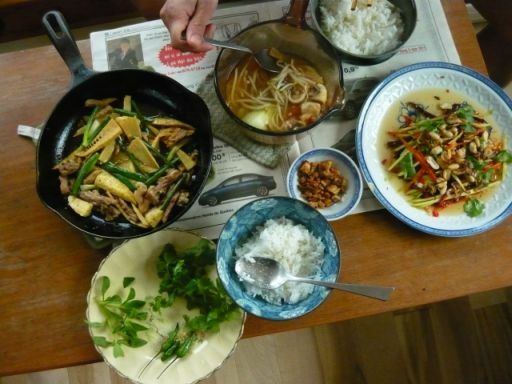 It’s such a central ingredient in the Vietnamese kitchen that articles about it abound on the web. In the Western kitchen, it’s not the unusual ingredient it once was. You no longer have to go to an Asian market to find it, because many supermarket chains carry it too. This thought led me to remember an article I read in the paper a number of years (ok, decades) ago, about a couple who ran a Vietnamese restaurant in Ottawa, and the food they served there. The woman said that when she first arrived in Canada with one of the waves of boat people, she craved fish sauce but couldn’t find it anywhere. A few years later, she discovered some at a grocery store. She was so excited about her purchase that she rushed home and took a sip straight from the bottle. The pungent flavour transported her back to her homeland. When I used to lead tours of Huế, my tourists would sometimes be lucky enough to meet this woman selling bánh bột lọc in the Thanh Toàn Tiled Bridge. 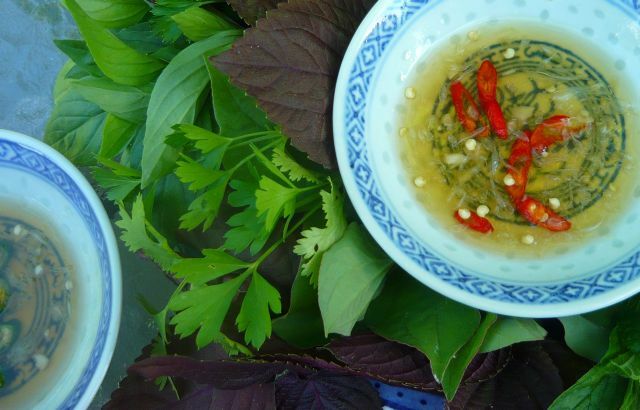 Her nước chấm (fish sauce-based dipping sauce) was always dark and fiery. Fish sauce is “what makes Vietnamese food uniquely Vietnamese,” says Nicole Routhier in her book The Foods of Vietnam, but fish sauce is popular all over Southeast Asia, and it’s been around in one form or another since Roman Times. The Vietnamese call it nước mắm (meaning fermented-fish water), and the best is made from cá cơm (rice fish), a silvery anchovy the size of my little finger, fermented with salt in wooden barrels or clay vessels. Everyone seems to agree that the very best comes from the island of Phú Quốc. But caveat emptor: the words Phú Quốc grace the labels on nước mắm from other parts of Việt Nam and even from Thailand, though efforts have been made to prevent this. In 2013, The EU commission awarded Phú Quốc fish sauce with Protected Designation of Origin certification, making Việt Nam’s fish sauce the first Southeast Asian product ever to receive this certification. 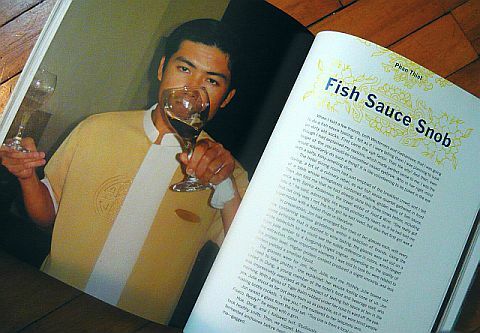 Communion includes two informative chapters on fish sauce, entitled, of course, “Afishionados” and “Fish Sauce Snob”. I’ve always wanted to visit a fish sauce plant, but still haven’t managed to do so. Kim toured one in Phan Thiết and then took part in a fish sauce tasting (yes, sipped straight up!). Her tasting notes confirm that I should keep this in my plans. As I mentioned in a review of Communion, I’d hoped to visit a Phan Thiết fish sauce factory (that has a ring to it, doesn’t it!) 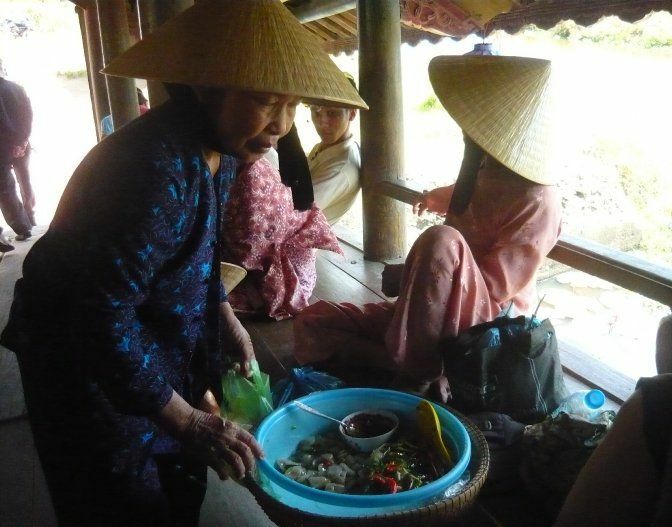 during my first visit to Việt Nam over ten years ago, but I was with my niece who was battling culture shock and requested that I not even speak the word “fish sauce”. Top quality nước mắm is just fish layered with salt and fermented for a year or more. Nothing added. But there’s more to it than that. Like olive oil, the first extraction is the most desirable. Labeled “nước mắm nhỉ”, it contains the highest percentage of protein (as much as 40%). The second and third extractions are for cooking. I go through a lot of fish sauce in my kitchen, using it for dipping sauces, marinades such as the one for the beef for this sautéed bamboo beef dish, salad dressing like the one for the green mango salad on the right, and there might even be a teaspoonful in the soup to enhance the flavour the way salt would, but with more oomph. In Canada, I’d always bought a Thai brand of fish sauce that wasn’t quite nước mắm nhỉ but it was still good enough to use for a dipping sauce. I never really thought about the different grades. In my mother-in-law’s kitchen in Huế, I discovered just how different the various grades are when I used the wrong bottle to make the nước chấm. I’d graduated from my position as chief garlic and chili masher to maker of the dipping sauce each evening. My mother-in-law approved of my addition of lime juice, even though it wasn’t part of her recipe for nước chấm. I was almost demoted back to garlic masher when we had to toss out the coffee-coloured, salty salty salty results of my mistake. I didn’t even like that fish sauce for cooking. When I dipped my pinky in and tasted a drop, I had to swish my mouth with water. It didn’t taste fishy at all. More like burnt salt. While this cooking sauce was almost black, top quality nước mắm has a lovely amber hue. It has a much milder scent too; to my nose, it even smells pleasant, but the pungency of fish sauce turns some people off. One friend of mine cannot stand to be in the same room with an open bottle of it. He’s no fan of nước chấm either. However, he admits that when used in cooking, it adds magic to the food. It’s a great stealth ingredient. If the cook is heavy-handed, the results can be overpoweringly salty, but add just a spoonful to a pot of spaghetti sauce and taste the results. No one will know what you did. A secret weapon. One of my favourite Vietnamese cooking methods is called kho, which means, more or less, to stew in fish sauce and caramel sauce. I often prepare salmon this way, adding chilis, coconut milk and green onions, and garnishing the dish with plenty of coriander. My husband’s mother taught me her methods for making “wet” pork kho and “dry” pork kho, and I make these often too. Red boat is said to be a very fine fish sauce, but I haven’t tried it. It’s not available in Canada (as far as I know), and I haven’t seen it yet in Việt Nam, although it’s made right in Phú Quoc. These bánh ướt wouldn’t be the same without the chili-dotted nước chấm on the left. Nước chấm is such a common and indispensable table condiment in Việt Nam, used for dipping lettuce- or rice paper-wrapped rolls, grilled meats, vegetables, fish, or even for drizzling on rice. I don’t measure my ingredients any more, relying instead on my eyes, nose and tongue, but below are the guidelines I give to friends when they ask for the recipe. Every Vietnamese cook has their own preferred ratio of ingredients, depending on where they are from and also on what dish the dipping sauce will accompany. Feel free to experiment, using less sugar, and more or less lime juice or even none at all. My husband’s mother’s recipe, typical of the Huế kitchen, includes no lime juice, very little sugar, and is quite strong, while friends of mine in Sài Gòn always make their nước chấm quite sweet and thin. I’ve seen many recipes that include rice vinegar, but I’ve always preferred it without. In her book Into the Vietnamese Kitchen: Treasured Foodways, Modern Flavours, Andrea Nguyen says that adding rice vinegar “actually brightens the flavors and softens any harsh or bitter edges contributed by the lime juice.” Her recipe calls for 1 tablespoon of rice vinegar along with the other ingredients to make 1½ cups of nước chấm. Other recipes include ginger or tamarind, both delicious with fish, chicken or duck. Combine everything and stir well to dissolve the sugar. Taste and adjust as desired. You may include a little of the lime pulp, or add some julienned carrot and daikon for a decorative look. If you have a mortar and pestle, you can pound the ginger and chili first, which helps to release their flavours and if you use red chilis, it will give a lovely reddish cast to the finished sauce. People like to use red chilis for their colour, but my husband prefers the flavour of green chilis, and these work well too. Nước chấm is best prepared fresh, but it will keep well in the fridge for a few days if tightly covered. This recipe can be doubled or quadrupled, but it’s more than enough for two people for one meal. This entry was posted in A to Z, Cooking, Food, Photos, Recipes, Viet Nam and tagged fish sauce, Huế, Lê Văn Lân, Nicole Routhier, Vietnamese food. Bookmark the permalink. Great article. I like your anecdotes, especially you’re near “demotion”. Vietnamese kitchens have high standards–I “lost my job” cutting vegetables once because I wasn’t used to cutting them so precisely. I’ve gotten better. By the way, we’ve tried Red Boat fish sauce. My husband bought it in San Jose, CA during a trip to see relatives, and now we stock up on it whenever we visit. It’s perfect for making dipping sauce with. I hope that you can find it in Canada soon. They do indeed have high standards! Even the outdoor ones and the ones that are just a cutting board and a two-burner stove. Thanks for the comment, Michelle. your pictures make my mouth water! This is a great series you’re writing. I don’t know how you actually have time to write with all this cooking! Thanks, Susi! That might be part of the reason it’s taking me so long to get from A to Z. Thanks so much for your comment, Khanh. I can’t imagine my kitchen without fish sauce either. 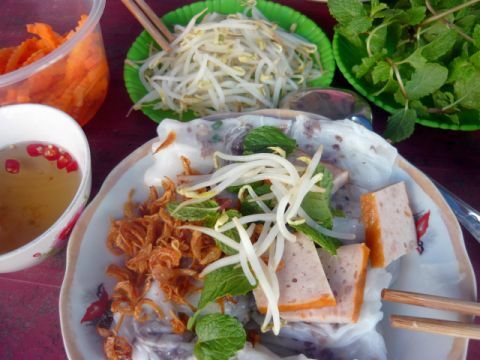 Yeah, have you ever try “kho quẹt”? My mother pour fish sauce to a pan and cook it until the liquid become viscous. We eat it with boiled vegetables 🙂 worth-trying! I came across this post from Freshly Pressed: such insightful writing that really makes me envy your travels! I absolutely loveeeeee Vietnamese cuisine! keep up the good work love pric nom pla!!! Great Post! Please keep sharing post like this as we are very interested in sharing and reading this.. Thanks! Great post. Worth to be freshly pressed for sure… I just love asian kitchen, just recently discovering Vietnamese style some more now… and your writing is inspiring. michasfoodblog.com will follow you now! Thanks for sharing this with us! Thanks Michael! Your blog looks pretty tasty too. Great post. Fish sauce is my #1 example of condiments I would never try to make at home. I’m lucky to live in NYC, and have access to fish sauces of many cultures, including garum. Like you, I often throw some fish sauce into what I’m cooking to bump up the flavor, irrespective of the ethnicity of the dish, and will use it mixed with water as a cheap and convenient substitute for/alternative to canned chicken broth. Hi Jamie, thanks for the comment. I wouldn’t try making it at home either. It can be done, but it’s “fragrant”. Imagine what a whole fish sauce village smells like when the wind is just right. But I guess people get used to anything. The stinkiest thing I ever made from scratch was Kim Chee. It was delicious, but quite fragrant while it was pickling (and every time I opened the container my partner commented that it was Kim Chee time). So I can imagine. What a nice article! Thanks for sharing. Thank you for reading, and for the kind comment. My country’s foods are good , right ? Steamed Clams with lemon grass and pepper salt. Mmmm, pepper salt…with lime juice… And, oh yes, clams steamed with lemon grass is wonderful. With pepper salt to dip them, all the better! Thanks for reading and commenting. Bánh Ướt is one of my favourites too! “A huge interest”…haha, well I cook it for almost every meal, so it’s unavoidable. Come back for more of my A to Z posts, because they’re all on Vietnamese foods and ingredients. I’ll be doing G next. Thanks Michelle! I hope to post it soon. Love this post, it’s the back stories that make cookery writing so interesting. I was transported to Vietnam and haven’t actually made it there yet – but soon I hope!!!! I agree about the back stories. Hope you get there soon. Great blog on fish sauce. I had to reblog on my blog because I wanted others to read it. I look forward to reading more blogs from you. Thanks for sharing, Busanee. Glad you enjoyed it enough to reblog. Hopefully, my post for the letter G will be up in the next day or two. Great blog on fish sauce. – Fresh Sấu cut the stem to run out all the latex, washed with clean water, peeled. – Soaked in diluted salt water, then wash with clean water several times. – Boil hot water, then drowns Sấu until the yellowish appears, pour the fruits to basket for cooling. – Cook sugar with water (1 liter water with 0.8 kg sugar), when it boiled, drop pounded ginger into the pot. – Boiling sugar water for about 1-2 minutes, then waiting for the water cool down. – Pour sugar water in clean jar, put Sấu into the jar, keep the jar in cool and dry place. – After 2-3 days, you can use it as a beverage. – After 5 days, you should keep it in the fridge and enjoy it. Please don’t buy Sấu ngâm which you don’t know it’s origins. Great! Thanks for sharing! And yes, your English is very clear. 🙂 It’s great to have a recipe for this, because I think it would be hard to find such a recipe. I’ve never seen sấu ngâm in a recipe book. Thanks for sharing the link! Enjoyed your page and photos about Vietnamese food. OK, Chris. As promised, here’s my feedback on Red Boat fish sauce, which I’ve been using for about 2 months now. Is it worth the price? Yes & no. You can definitely ‘taste’ the anchovies. It seems less harsh than common brands. It certainly is familiar to me for I grew up with Phu Quoc’s natives, the maternal side of my family. If you use it for raw dipping (un-diluted, straight out of the bottle) with soup, Vietnamese style, or nuoc mam song, then it’s worth it. If you’re to mix it as a dipping sauce for rolls, noodles & fried dishes, then it’s not. After cutting with water, adding lime/lemon juice, sugar, garlic & pepper, you can no longer tell it apart from other brands. Sonny, thanks so much for your opinion about the Red Boat fish sauce. I really have to try it some day. Especially now that the news is out that 80% of Phu Quoc fish sauce isn’t from there at all. I rarely use FS pure / nuoc mam song, but use it often for dipping sauces like the one I described above. Maybe if I tasted a really high quality one, that would change. Still really want to do a proper fish sauce tasting one day. When I started out, it was down to using too much fish sauce rather than the brand itself! I think it’s great in cooking. Mmmm Jackfruit. Looking forward to reading your next post.